George Lucas’s universe of space travel and fearless Jedi knights is a pop culture phenomenon that has thrilled movie fanatics for decades. It’s been ten years since we were last transported in our cinema seats to a galaxy far far away, and as the release of the latest Star Wars film edges closer, we can barely contain our excitement. Here at Blue Forest we can’t wait to see The Force Awakens. We all love Star Wars for many reasons; the classic movie moments, the countless twists and turns, the incredible imagery and the unparalleled imagination of its creator, but most of all, for one particular furry galactic creature that shares our love of the great outdoors. George Lucas always intended for a more primitive species to overthrow the Galactic Empire, and had originally planned on using Wookies for the job but decided against it and created a new species instead. The Ewoks are a plucky and charismatic species, who live on the forest moon of Endor, the smallest moon located in the Outer Rim Territories. Adorably fuzzy yet deadly with a spear, Ewoks live high among the canopy in villages built on wooden platforms. 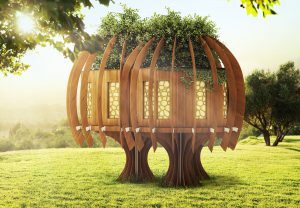 Treehouses have always been included in some of the greatest fictional classics, which is what gives them such a magical feel, and for us the only thing better than a fictional treehouse is a whole village of fictional treehouses. Ewoks lived high up among the trees, to protect them from predators. They had a ‘central village’ of thatched-roof huts and suspended knotted rope bridges linked up to the more dispersed tree huts. 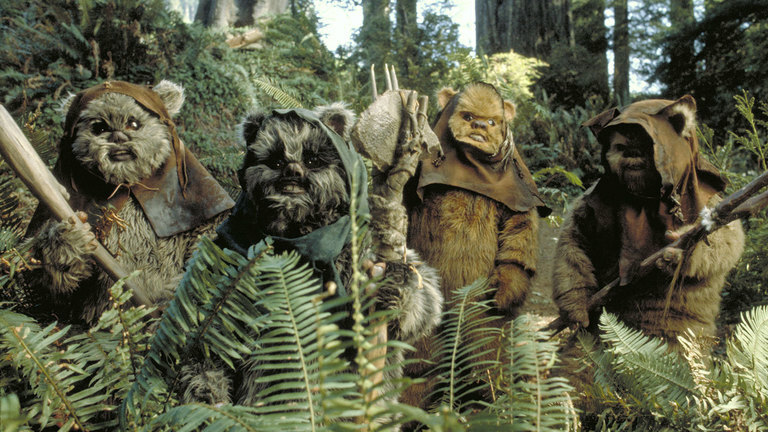 Standing one meter tall, the Ewoks enjoy a technology-free existence, living off the forest around them. Despite their cute appearance with their fur and bright eyes, and the fact that they only had two fingers and an opposable thumb on each hand, they were not to be messed with. They used hang-gliders as vehicles to get from one treehouse platform to the other, were skilled in forest survival and were physically strong enough to overpower a fully-grown combat-trained human. In The Return of the Jedi, the Ewoks assisted the Rebel Alliance during the Battle of Endor. When advanced technology meets primitive weaponry in a galactic space battle, you would expect there to be only one winner. However, through incredible bravery and teamwork, the Ewoks help to defeat the evil Empire by destroying the second Death Star. Scenes in the dense jungle of Endor were shot in Redwood National Park in California. The Ewoks are named after the Miwok, a Native American tribe indigenous to the national park. The old-growth temperate rainforest is home to the world’s largest trees, an ideal location for an arboreal species to call home. Several scenes, such as the iconic Speeder Bike Chase and the Ewok Ambush, were shot in one of the park’s many redwood groves in Marin County, near to the home of George Lucas at Skywalker Ranch. The Ewoks proved to be so popular, that they were given two spin-off films and their own animated television show called Star Wars: Ewoks which was aired by ABC for two seasons from 1985 to 1987. They also had their own bi-monthly Ewoks comic which was published by an imprint of Marvel Comics. If you’re looking to experience the Ewok way of life, have a look at Finca Bellavista – a sustainable community of treehouses located in the south Pacific coastal region of Costa Rica. The treehouses are joined by a series of walkways and zip lines high in the forest canopy. The rustic retreat invites guests to explore the natural wonders of the rainforest and enjoy a simpler life. Those that call the rainforest home have become accustomed to life on the outer fringes of civilization, similarly to the Ewoks who live in harmony and natural equilibrium with their surroundings. Since its inception in 2006, Finca Bellavista has seen progress in getting the community “off the ground”. The base camp is complete with a dining hall, open-air lounge, bath house, campfire ring and wedding garden. Treehouses are starting to speckle the treetops with a handful ready for rentals and tours. Though Finca Bellavista provides an experience for humans to dwell within the treetop realm, the aim of the project is to educate and conserve. Those behind the project are fully committed to providing an opportunity for ecologically minded individuals to reside with the unique rainforest ecosystem while promoting the conservation of its indigenous and endangered species.